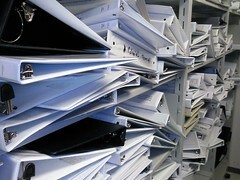 If you use accounting software there is no longer a requirement for you to keep paper invoice copies on file. However you do need to be able to produce this information at the request of the IRD, so it is important to have the data backed up regularly and securely, ideally in three separate locations; for example to a separate hard drive/flash drive and the cloud. Many contractors are not aware that this information must in fact be kept for a minimum of seven years. MTR provides its contractors with electronic IRD approved Buyer Created Tax Invoices, removing the need for contractors to submit invoices. Any recruitment agency generating BCIs on behalf of their contractors must also keep the information on file for a minimum of seven years, and are obliged to produce this information at the request of the contractor and/or IRD. To make record keeping simple we recommend attacking it on at least a monthly basis. Keep a checklist on file to ensure everything is ticked off; for example reconciling accounts, paying and filing creditor invoices, recording mileage and home office expenses, not to mention PAYE and GST obligations – rather than tearing your hair out trying to track down receipts at the end of the financial year! Tanya has over 10 years’ experience in contractor administration and office management. She also advises that to Meowbify this post, click here.